We stopped off here on our way back from Minerve, to discover another small town, so beautiful and steeped in history! The name Mirepoix in Occitan (Oc) the local language, is supposedly Mire Peis, which means " see the fish". An 18th century local lord, the Duke of Levis-Mirepoix has been described as an "incompetent individual" (!) but as an Army field-marshal and friend of King Louis XV, he gained some fame by giving his name to the culinary concoction Mirepoix- chopped celery, onions and carrots (there are apparently endless variants - I'm not going there! ), which is used as a flavour base for many dishes like soups and sauces. 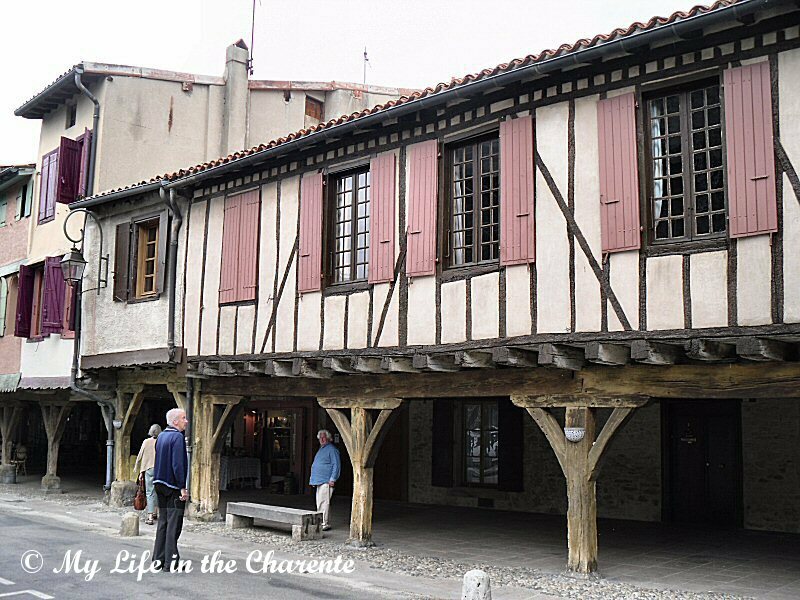 Enough of the culinary anecdotes, the delight of this fortified town of about 3,000 inhabitants derives mostly from its stunning buildings! Our old friend (!) Simon de Montfort took the castle during the Albigensian Crusade (see last blog for more) after a siege in 1209, dispossessed the Cathar-supporting owners, and gave the town to his loyal lieutenant, Guy de Levis. Depending on which website you consult, the original town was destroyed in either 1279 or 1289 (town website says the latter) after a barrage on the river Hers gave way, and the water flooded the town. Reconstruction, by Jean de Levis (son of Guy), started on the opposite bank of the river in the following year (probably 1290, then! ), the streets being laid out in a medieval grid pattern. which remains unchanged to this day! 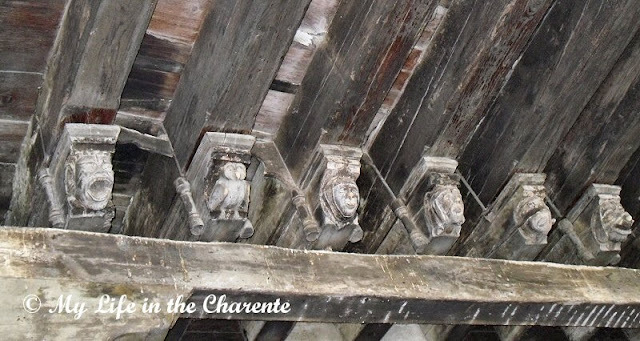 The shots above and below are of the town centre-piece, the market square or Place de Couverts, built at this time. The design of the facades allowed private habitable spaces to be extended over the public areas, providing more living space and forming sheltering arcades underneath. These arcades provide shading and seating areas for the shops and businesses, including several cafes and restaurants, operating in the buildings behind. It is a delightful spot to stop for a while and have some refreshment! Once rebuilt, the town recovered its prosperity during the 14th century, but was subjected to raids by armed bands, who sacked the town and set parts ablaze. Thus further defences, including four big stone town entrance gateways, were constructed. These individually carved decorative gargoyles on joist ends (I saw a note somewhere to say there are 150 of them, but that sounds far too few) are fascinating! Many have been badly damaged by the elements; the most surviving are faces with a variety of facial expressions, ranging from surprise to anguish, and can be studied for some time! And see the owl too! You can just imagine those woodworkers of old sitting carving in that square! The cathedral of Saint-Maurice de Mirepoix today. Originally built in 1298 by Jean de Levis as a church, it was enlarged over the centuries. It has a 22 metre (70 feet) wide nave, said to be the widest in Europe apart from Girona cathedral in Spain! 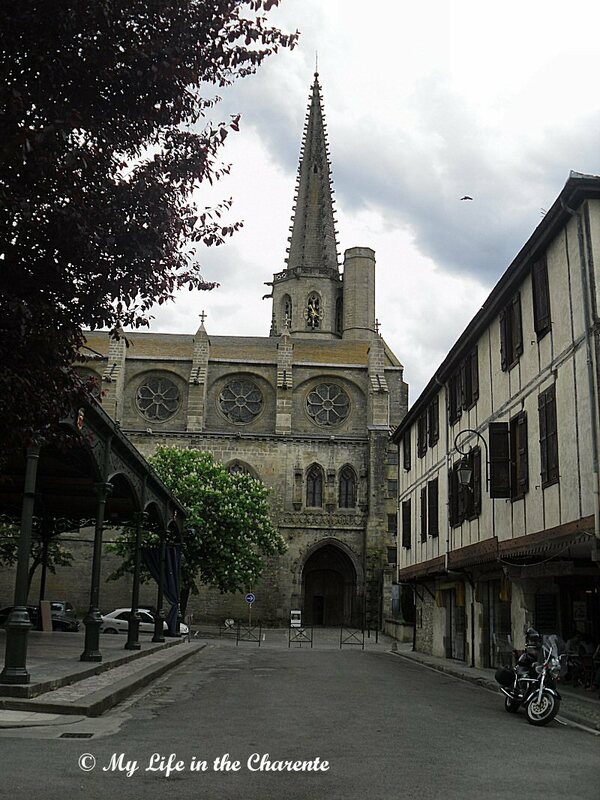 Once the now-abolished seat of the Bishop of Mirepoix, the cathedral is quite rightly a listed monument. 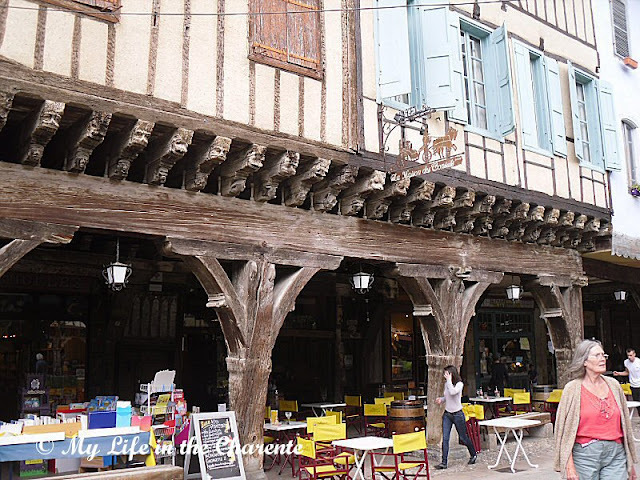 There is also a covered wrought iron market hall adjacent to the square, built in 1885 and undoubtedly replacing, a nearby sign says, an enclosed stone and timber building which was demolished at some previous time. This hall comprises a lantern light roof standing on a wrought iron industrial style structure with 16 columns, a design popular from the 1850's. The roof profile provided enhanced lighting and ventilation beneath it. See to the left of the above photo. For some obscure reason I did not take a full photo of it! Nigel trying to count the number of gargoyles!! 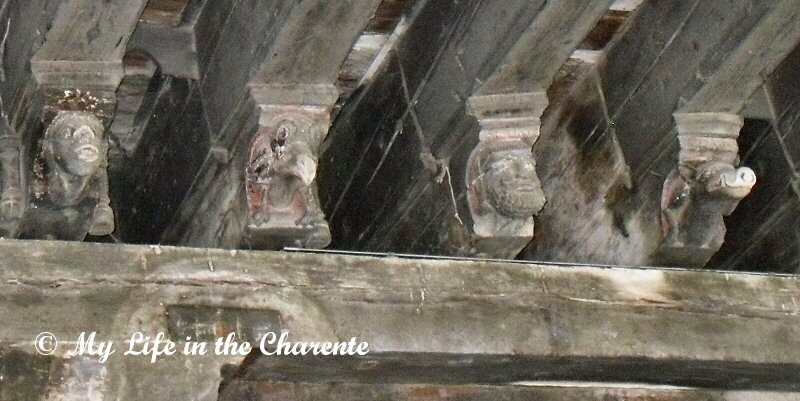 Just to think these ancient oak columns and beams are still standing today - although one can see the evidence of "running repairs" carried out over the centuries! One of the streets leading into the square. Markets are still held each week on the large grassy island in the centre of the square. 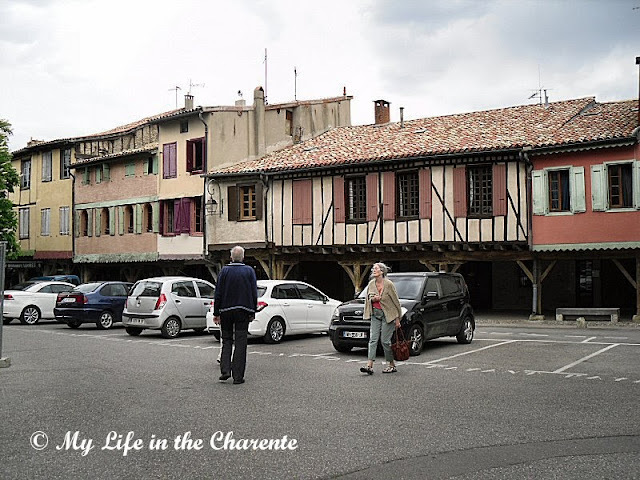 Due to its proximity to Carcassonne airport and the budget UK airlines which fly there, the Ariege area has become very Anglicised, with café signs advertising food in English and English newspapers having become quite common. Otherwise, it's still remarkably unspoilt!!! An amazing (I think!) panoramic view of the square and whole town can be seen HERE and is well worth a visit. It also shows clearly the covered market. My thanks once again go to Nigel for all his research and writings. Love that architectural design and the carved gargoyles. i just love those gargoyles! you see the most interesting places. Most interesting! Of course, if you love history, and travel, these can make fascinating research pieces as you travel along. I enjoy all these tid-bits more than ever as I have become a rocking-chair travel lately. You do have a way of finding the most interesting villages Diane. This one looks especially lovely and I could quite happily spend some time there. Thanks for the tour - much appreciated! I have no idea why I have never been there. My niece lives not very far from Mirepoix (in the next "departement"). Last time, we visited Foix again since I like it so much and wanted my son to see the castle. 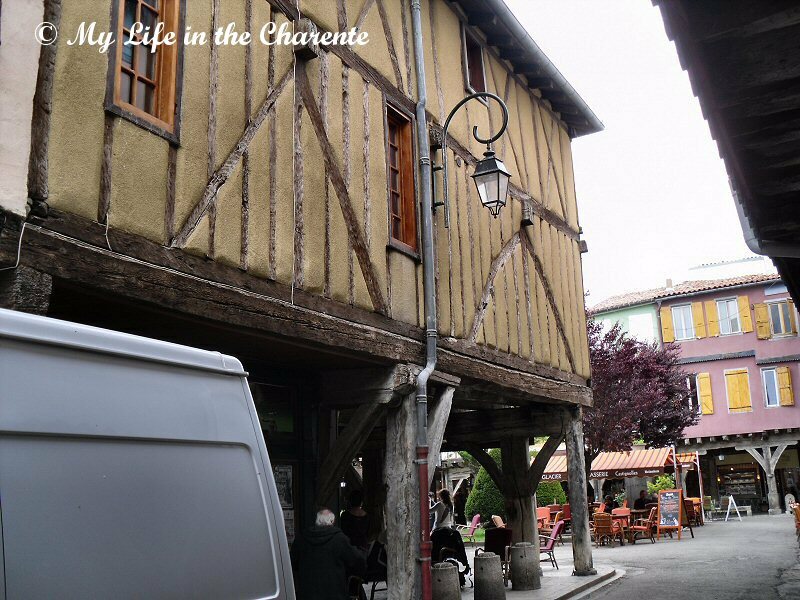 All those "departements" along the Pyrenees are very nice and the local food very good. The treat is to be so close to Spain too! Hi, I'm a new follower. I love your blog, such beautiful pictures. I would love to visit the Pays d'Oc one day. I've read the book by Kate Mosse "Labyrinth", which is set in this part of France. I'm interested in the history and the culture of this part of France. Thank you so much for the wonderful info. What a charming town. I love the colourful shutters and could see myself spending time in the bistros at the city square. This town is so amazing. The fortified buildings are so beautiful. The villages in France are so full of unspoilt beauty, and this was most definitely one of them. Have a good week. The number of tourists will increase after you advertising this so well. I love the carved wooden gargoyles even though some have been ravaged by the elements and the passage of time. It looks like an interesting town and area to visit. It would be a great stop off en route for the Pyrenees. I love the style of architecture, it's so different from where I live. Thanks for the tour! Thanks you for those super photographs and the accompanying research...you make a great team. 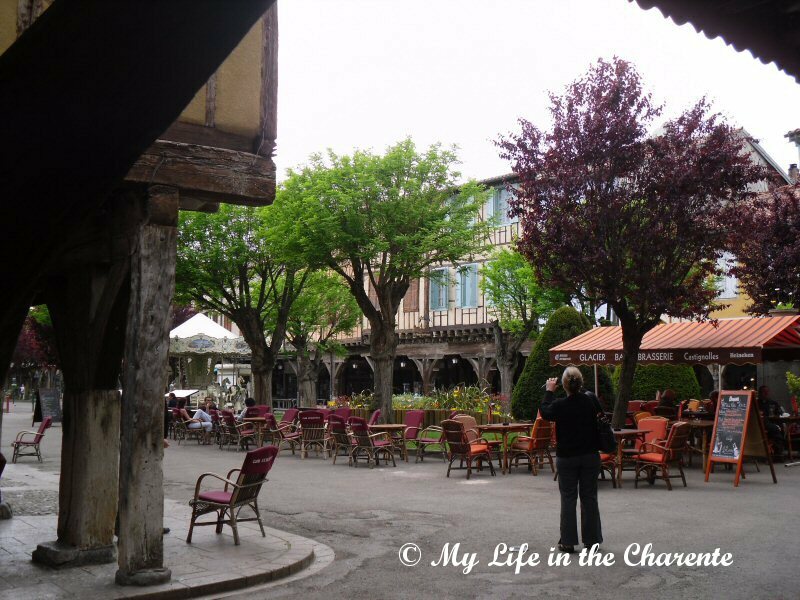 I have always heard that Mirepoix is a beautiful village. Well known for its culinary connections, two of my friends opened a French bistro they called Mirepoix. Thanks for sharing your pictures. Have a great week. I love the bastide towns. I've spent many happy hours in the shade of arcades in old towns like this. 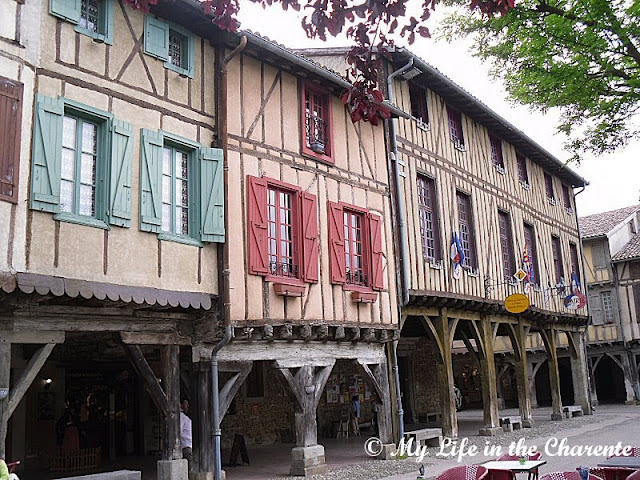 Although I've never visited Mirepoix, despite the fact that I knew someone who lived there years ago. I'm getting all nostalgic, now, so I'm off for a refreshing glass of something before I start to wallow completely in nostalgia. Grâce à toi, je découvre à chaque fois un peu des régions de France. Nadji c'est un plaisir et je suis heureux que tu les aimes. It is hard to imagine to imagine anything being constructed in the year 1290-especially for Americans (laugh). This town is pretty amazing. The combination of onions, celery, carrots...etc is also called the holy trinity in New Orleans Cooking whose culture is most certainly influenced by the French. Another fascinating village. Those supports don't look that strong but I guess if they have survived for so many centuries they must be okay. The under cover shopping reminds me of Bern, where it is a similar architecture except in stone. So the Duke is credited for mirepoix. I don't believe he was incompetent at all. What would be do without our mirepoix? What gorgeous old façades! Fabulous buildings. I usually associate those timbered buildings with English architecture. It's very interesting to see an entire town built in the same style. That's a fabulous village that I don't know yet but that I should quickly discover ! Such a neat little village. The cathedral is stunning & I love those little gargoyles. You mention Louis XV, what a character, I'm reading a book about Marie Antionette now. The gargoyles are something else, quite a few and it seems like when we saw Notre Dame they said there were a few thousand there! It's amazing how much has stayed the same in towns there and so different here with structures that come and go so quickly. What a fabulous town I've never heard of. I wonder why it has this unique architecture with the overhanging building technique (and all those fabulous gargoyles!). Thanks for the tour. How do you find these places? I'm not surprised you were delighted with this find ... I hope the tourists don't flock in and it retains its ambience ..
Why on earth is it called Mire Poix (see the fish)??? Madame, vous avez un beau blog qui était un plaisir à découvrir.